HomeLifestyleSustainabilityThe Inner West Says Stop Adani! The Inner West Says Stop Adani! Inner West citizens gathered in Camperdown Rest Memorial Park, Newtown, on October 7, in protest of Adani’s proposed Carmichael mine in the north of the Galilee Basin, Queensland. The $16 billion planned coal project has caused controversy right across Australia for its deplorable economic and environmental viability. The Carmichael mine is one of the biggest coal extraction projects anywhere on the planet. If it goes ahead, it will release some 128 million tonnes of carbon dioxide each year of its operation. That is the equivalent of a quarter of Australia’s total emissions from fuel combustion. It is also predicted to contribute enormously to coral bleaching. Half the coral colonies of Australia’s prized Great Barrier Reef have already been decimated due to ocean warming. For local Queenslander farmers, the mine is predicted to lower bore water levels by about 20cm, meaning the amount of water pumped out for farming will be less, and water quality will be severely reduced. In early October, ABC’s Four Corners program aired an investigation into the business operations of Adani in its home country, India. The investigation surfaced hundreds of violations of environmental, tax and export laws. Paranjoy Guha Thakurta, renowned economist, commentator and public intellectual of India, has described the Adani corporation as “a business conglomerate who will not stop at anything to maximise their profits”. Despite Adani’s track record, the monopolising mining giant is set to begin construction in Queensland sometime this year. However, with all major Australian banks now having ruled out funding, the project is relying on funding from the Australian federal government. 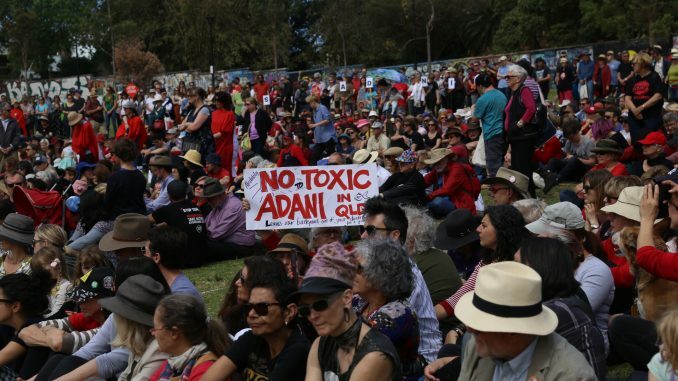 October 7 marked the day when thousands of activists gathered all over Australia to put pressure on the federal government to not lend $1 billion of taxpayers’ money to Adani. In Newtown, concerned Inner West activists created a giant human sign that spelled out: Stop Adani. Local community voices like these are fundamental in vocalising opposition, and driving the fight against the unsustainable mining project.